Sagar Gurung did B Tech in EEE. After his graduation, he started his own company by the name Web Plan Solutions. After running it for 2 years he decided to shut it down. He then did certifications in Java, PHP, .Net & Robotics. He then worked with Mymind Infotech as a Senior Developer for 2 years. In 2018, he and one of his friends came together to work on an advertising mobile application called Ifadvertisings. He has developed the application single handedly. He is Co-founder & Full Stack Developer at Ifadvertisings. 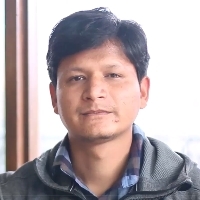 "After completing B Tech in EEE, I started my own company by the name Web Plan Solution Pvt Ltd. After running it for 2 years, I decided to shut it down and did certifications in Java, PHP, .Net & Robotics. I then worked with Mymind Infotech as a Senior Developer for 2 years. In 2018, one of my friends and me came together to work on an advertising mobile application called Ifadvertisings. I developed the application single handedly. I am Co-founder & Full Stack Developer at Ifadvertisings."